Sixty-four percent of website visitors are more likely to buy a product after watching a video. By 2021, it is estimated that video will be 82% of all consumer internet traffic (it was 73% in 2016). Fifty-two percent of marketing professionals think that video has the highest ROI. For those planning to add video testimonials to your marketing portfolios, we have created a two-part guide to assist you as you develop your strategy. The first part guides you through the planning process, while this section has tips for filming, editing, and posting your finished videos. Viewers of the finished video can forgive a lot of imperfections, but the three aspects of a video that should be as near to perfect as possible are the audio, focus, and lighting. If people can't see or hear the subject properly, then they will not take the time to watch the video and understand its message. If you want to keep the viewer interested in your video you should also plan to add movement to the footage. This can be accomplished by using several different angles in your interview, and cutting to relevant b-roll while your interview audio is running. In testimonial videos, b-roll usually comprises of visuals of the company's staff using the product. To add something different, you could hire an animator to visualize the story being told. Having the customer speak directly to the camera creates the maximum connection in online videos. This vlogging style interview is very popular online and helps keep the viewer's interest because it seems like the customer is speaking directly to them. However, it is also the most difficult type of interview to get right because the customer has to be very comfortable talking to a camera. It's rare to find someone like that, so most customer testimonials are filmed with the customer talking to an interviewer sitting off-camera. The most tricky aspect of filming this way is that the interviewer has to remember to be silent when the customer is talking. We're all so used to adding verbal cues that we often forget we're doing it until we play back the audio and realize it's ruined by the interviewer saying "uh-huh" and other verbal ticks over the interview subject's answers. Editing software is pretty user-friendly, so you should be able to edit the footage in-house relatively easily as long as it's been shot with excellent audio recordings, lighting, and focus. If you need to add anything fancy, do extensive editing to correct filming errors, or simply don't have the expertise on staff, you can also send the footage to a professional to edit. This is an excellent solution for companies who don't have the budget to outsource the entire process but would like the end-product to have professional polish. If you do edit in-house, this is the step where you can splice b-roll into your interview, add titles, transitions, and a soundtrack. You should also add your logo to the video—definitely in the opening sequence, but it can also be ever-present in the lower corner of the video—and a call to action at the end of the video, so viewers know who to contact for more information. Another important feature to add at this stage is captioning. At least 85% of Facebook videos are watched with no sound, and about 466 million people have a disabling hearing loss, so to reach the maximum number of potential customers, adding captioning is a must. As you're editing, don't polish it perfectly before showing it to the stakeholders who have to approve it. Put rough cuts together and show them updates several times through the process. This allows stakeholders to quickly catch aspects of the video that aren't working for them and redirect the editing process. It'll save a lot of heartaches to catch these corrections while editing, rather than at the end. It might be worth looking into a video hosting platform that allows internal stakeholders to add comments to the videos themselves at the exact timestamp to which they are referring. A platform like this will make the editing process run more smoothly and reduce confusion about requested changes. Don't forget to involve your customer. At the very least, they need to approve the end product since it will affect on their own brand, but you may want to involve them further in the planning, filming, and editing. It all depends on your process and your relationship with the customer. By the end of the process, they need to pleased with the end product and how it came about. Now that you have the completed video, it's time to put it to work in your marketing plan. Distribute it widely across platforms. Host it on YouTube, which is the second largest search engine after Google, and tag it with all the keywords related to your industry and target audience. Create a blog post or two about the work you did with the customer featured in the video. Write about the entire process—from consulting, setting up your product, and training to the results (all with customer permission, of course). Whether you do one or multiple blog posts about your work with this customer, embed the video in each post. Use your best testimonial videos on your contact pages, the product pages on your website, and even the homepage. Consider embedding the videos in related case studies and white papers your company creates and use the videos in your email marketing campaigns to potential customers. Perhaps most importantly, use the videos on social media. 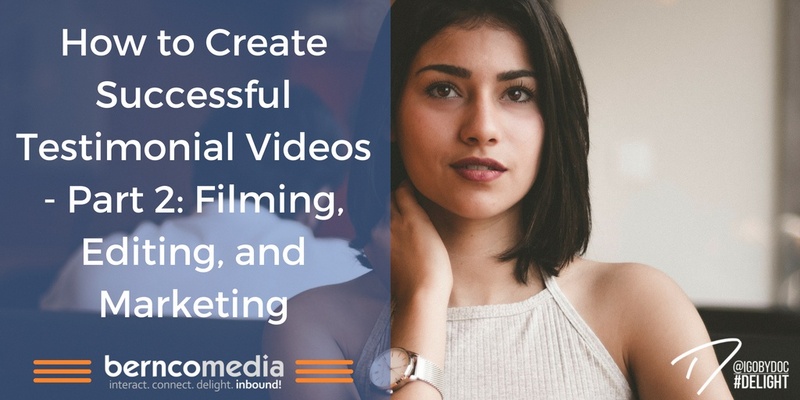 Video content is popular on almost every social media channel, so use the testimonial videos through both your posts and through social media advertisements for your target audience. Though creating customer testimonial videos can seem intimidating at first, if you follow the steps set out in this guide, your company will quickly be on its way to building a robust customer testimonial library that can be used on your website, in your emails, and on social media to create leads and increase conversions. Whether you need help planning, filming, editing, or marketing your customer testimonial videos, Bernco Media can help. Contact us today for a consultation.